- Paul John Faeldo on 十二月 14, 2016. On December 5, 2016, we attended Toronto Market Company’s 3rd Annual Union Station Holiday Market 2016 (USHM). Located in the heart of Union Station, Main Floor West of Great Hall, USHM offers commuters and visitors a chance to get their holiday shopping and that perfect gift on the go. The market is meant to be a convenient way to shop and embrace the holiday spirit while enjoying a stress-free experience. To top it off we got to watch musical performances by Frost and Ivy with a selection of Toronto’s best treats and sweets. Toronto Market Co.’s Union Station Holiday Market showcases vendors, artisans, designers, food merchants, and cultural institutions you can find for unique holiday gifts. At BATHORIAM, products that stood out were the artisanal bath bombs and body soaks.They are like heaven in a ball. They are a Canadian start up on a global mission to #bringbackthebath. If you have a love for chocolate, CHOCOME has a variety selection of original artisan chocolates: Raffinèe, Voilè, and Chocolate bars. 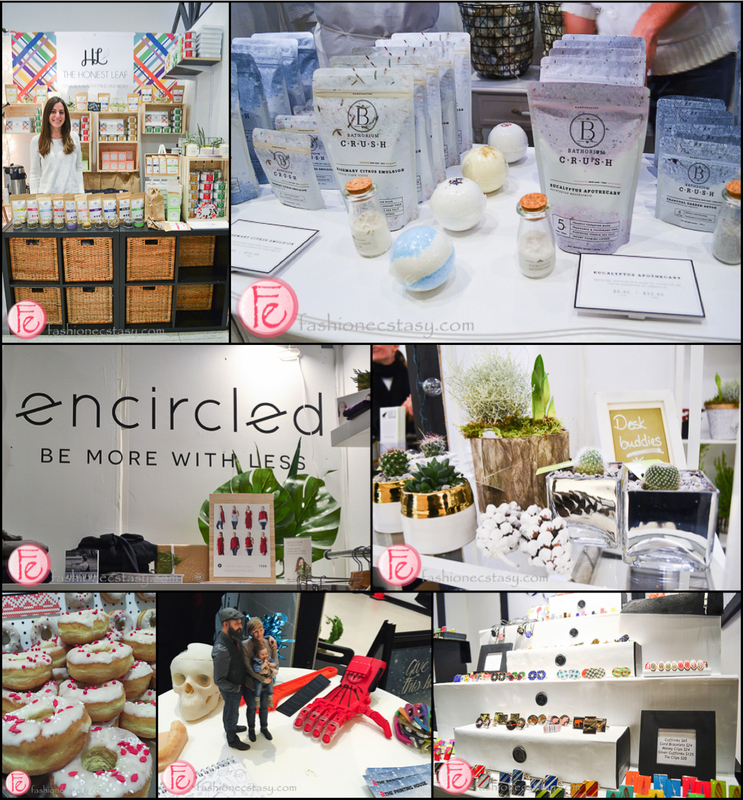 ENCIRCLED has a clothing line for women filled with ethical, sustainable, and versatile products with a motto that speaks “BE MORE WITH LESS.” Their mission is meshing functional with style quality over quantity helping the planet by choosing fabrics that are good for earth and with the production process made 100% in Canada. FOXY ORIGINALS has stylish and affordable jewelry for the ladies if you are looking for a good selection of earrings and necklaces. G. FOX & CO has a variety wood sunglasses and watches you can wear with style along with a line of hats with Hawaiian prints. THE HONEST LEAF, sold at most restaurants in Toronto, brings tea for a healthy mind and body to USHM plus a selection of candles and gift packages. For the guys, KINZOKU offers custom jewelry & accessories. For cufflinks, you can rock out and look fancy with a cool selection of designs including hockey rinks and sticks, the CN Tower, beavers, and moose. KNIXWEAR’s mission is to create active intimates on the planet that empower women to do more of what they love. Partnering up with North York General Hospital, they sell limited edition bras to raise Breast Cancer Awareness. LABORDE, the owner’s last name, creates jewelry that reflects the individual who wears it. They are eclectic handmade jewelry made from materials like precious stones, mixed metals, industrial findings, leather and beautiful beads. LEE’S PROVISIONS, maker of organic ghee, are sold in little jars inspired with Indian origins and has a gift set for a limited time of Plain Jane, Noisette, Za’atar Star, Gold Standard and Maple Baby that foodies would enjoy. Will you be traveling for the holidays? MELISSA BETH DESIGNS has cheerful travel accessories that turn boring into adoring. With their vibrant colors and artistic functional designs, they will make your travels stylish and fun. MENOS is a Canadian importer that works directly with producers of high-quality traditional products such as Spanish olive oil, Japanese stone-ground matcha green tea, Ecuadorian guausa tea, Peruvian dark chocolate, and Canadian honey with ginger or turmeric. For all you chocolate lovers, MOROCO CHOCOLATE, now in Dupont in the Annex, has beautiful chocolates, confections and macaroons that would make great treats for this holiday season. PAPABUBBLE decorated with ornaments had a selection of colorful candies to choose from: lollipops, gummies, and a variety of hard made candies that y ou can custom design yourself for weddings, birthdays, or other special occasions. They’re even appropriate for stuffing your stockings for the holidays. SAHA INTERNATIONAL CUISINE offers the public a product line inspired by international street food showcased with Middle-Eastern product lines of Thai curry bases and Caribbean/cooking bases that are unique, healthy, and delicious. SWEETPEA’S known to be Toronto’s best florist and offers a set of unique floral creations to the city. There was a nice set of tiny Grinch Christmas trees that you can place in the office or your living room. Their booth is also filled with beautiful gifts and cards for that special someone. TWIG FLOWERS are tiny “desk buddies” and are perfect accessories to add a bit of nature in your space. YO SOX¬ has fun and fashionable socks that you can wear for any occasion. Even when you feel like showing your love for bacon and eggs, sushi, chicken wings, the CN Tower, or something casual to wear to Netflix and “CHILL”. There will be Pop-up Appearances by LOVEBOT from December 8, 9, 10, 16 and THE PRINTING HOUSE 3D SELFIE SCANNING STUDIO December 11-15, which we also got a chance to see the second time we visited the market. It is a must see.